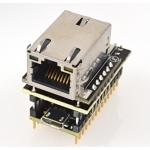 The WIZ820IO ethernet module is not included with this adapter board. Special extended male header pins are available to connect this board to a Teensy 3.0/3.1. Two pin headers are required. This table lists the electrical connections on this adaptor board. The WIZ820io and SD card are connected to the default pins used by the Arduino Ethernet and SD libraries. For the SD library, pin 4 should be used in the begin() function. By default, the center and right side of the jumper pads are connected, which keeps the WIZ820io powered up. For low power applications, the pads can be cut apart and the left+center joined to allow pin 8 to control the WIZ820io powerdown feature.